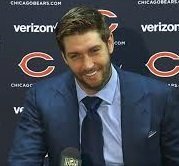 May 5, 2017 - There will soon be another quarterback entering the broadcast booth with the news that Fox Sports has hired Jay Cutler as an NFL game analyst. The move comes in the wake of CBS naming Tony Romo as their top analyst, with Phil Simms heading to "The NFL Today" studio show. Cutler, an 11-year veteran with the Denver Broncos and Chicago Bears, will be part of the No. 2 broadcast team in a three-man booth alongside play-by-announcer Kevin Burkhardt and analyst Charles Davis. This will allow the 34-year-old to get his feet wet the same way that Troy Aikman did when he entered broadcasting in 2002, working with Joe Buck and Cris Collinsworth. Cutler, who holds almost every passing record in Bears franchise history, was released by the team in March. He was in discussions with several teams, including the New York Jets, but opted to join Fox. However, the former All-Pro has not ruled out the idea of playing again. "I don't know if retirement is the right word; I don't feel that anyone ever really retires from the NFL," Cutler said. "You are either forced to leave, or you lose the desire to do what's required to keep going. I'm in between those situations at this point in my life." It's unclear if Cutler was given a clause in his contract that would allow him to return to the field. But if he was, the three-man booth would also serve as a safety net for Fox if a mid-season QB injury forces a team to come calling for his services.